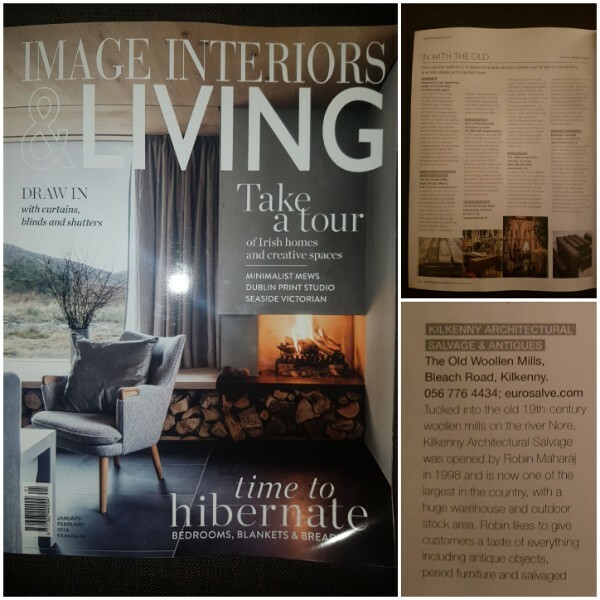 Image Interiors & Living included us in their January/February issue for 2019. The feature included a discussion of the top places around Ireland to source old and interesting items. Kilkenny Salvage were one of the standout names that came from their research. From cast-iron radiators to reclaimed floorboards and retro furniture, why not pick up the real thing at an Irish salvage yard. Tucked into the old 19th-century woolen mills on the river Nore, Kilkenny Architectural Salvage was opened by Robin Maharaj in 1998 and is now one of the largest in the country, with a huge warehouse and outdoor stock area. Robin likes to give customers a taste of everything including antique objects, period furniture and salvaged materials, and as a result his customers are often a mix of homeowners, architects and commercial designers looking to a give a restaurant or bar some old-time authenticity.